Perfect for a romantic evening, or any day of the week, this beautiful and natural, thick rough slab of genuine Rose Quartz is a tealight candle holder. Handcrafted in Brazil. Tealight candle is included. 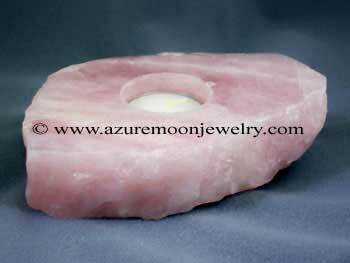 Measures 1 1/4" H - 5 3/4" W - 4 1/4" D.
Click here for the matching Rose Quartz slab candle holder (Item: SS-2146-2) - sold separately.